Product Analysts play a pivotal role in the launching process of a company’s new product. These Analysts oversees the product launches and employs various market research techniques as a way to successfully launch the product. 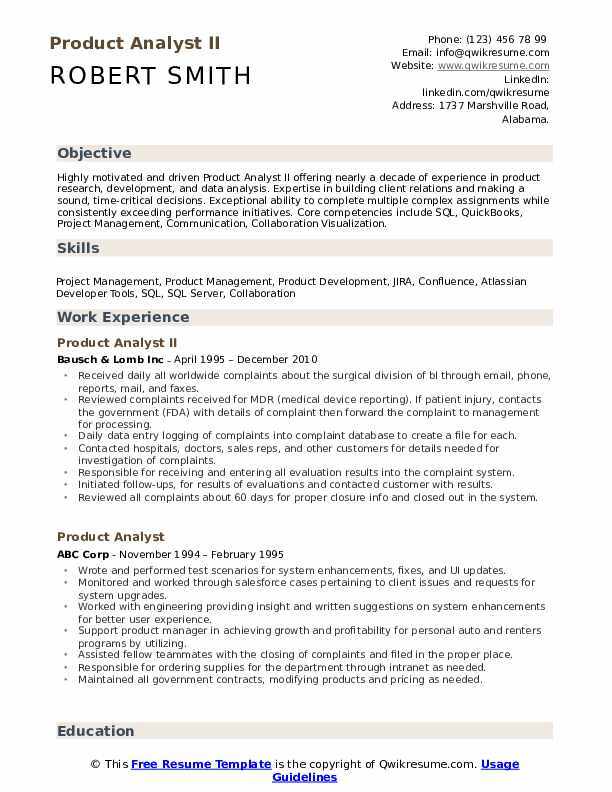 The roles and responsibilities that are commonly depicted in the resume of a successful product analysts include – providing projected costs, collaborating with product development team, utilizing data analysis software for anticipating the marketing trends, projecting the exact cost of developing and marketing the new product, creating performance reports, determining upgrades to enhance sales volume and monitoring constantly the product performance at the market. 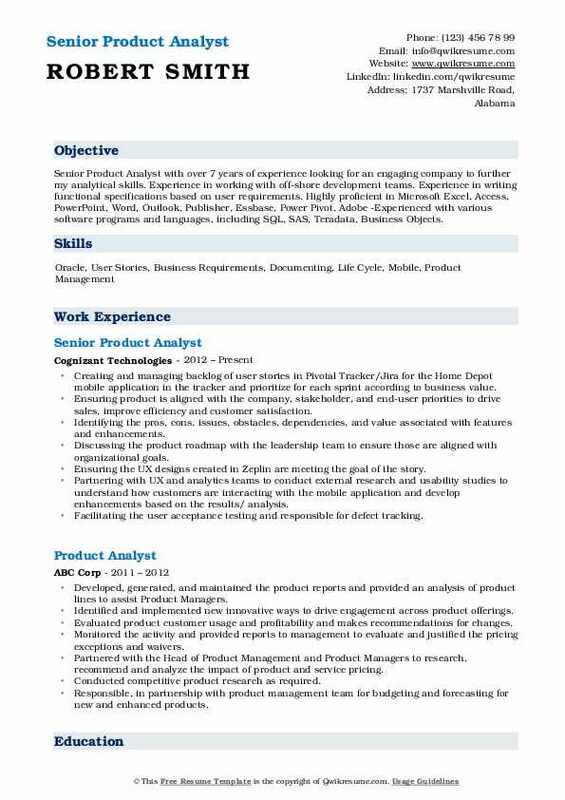 For hiring a product analyst, an employer normally looks out for the following core skills in the Product Analyst Resume – product management experience, advanced SQL skills, familiarity with working tools like Oracle, MS office suite applications and PeopleSoft applications. The minimum educational requirement for this post demands a degree in Business or Finance or its equivalent with functional experience. Summary : Highly motivated and driven Product Analyst II offering nearly a decade of experience in product research, development, and data analysis. Expertise in building client relations and making a sound, time-critical decisions. Exceptional ability to complete multiple complex assignments while consistently exceeding performance initiatives. Core competencies include SQL, QuickBooks, Project Management, Communication, Collaboration Visualization. Received daily all worldwide complaints about the surgical division of bl through email, phone, reports, mail, and faxes. Reviewed complaints received for MDR (medical device reporting). If patient injury, contacts the government (FDA) with details of complaint then forward the complaint to management for processing. Daily data entry logging of complaints into complaint database to create a file for each. Contacted hospitals, doctors, sales reps, and other customers for details needed for investigation of complaints. Responsible for receiving and entering all evaluation results into the complaint system. Initiated follow-ups, for results of evaluations and contacted customer with results. Reviewed all complaints about 60 days for proper closure info and closed out in the system. Worked with the quality assurance, product managers, and manufacturing to ensure timely investigation results are obtained. Received product complaints about us for the surgical division through the mail, faxes, or phone. 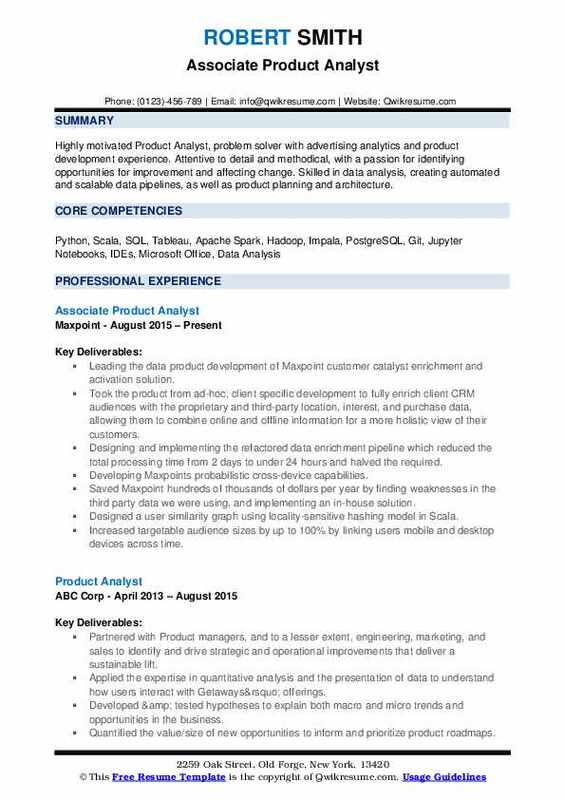 Headline : Highly motivated Product Analyst, problem solver with advertising analytics and product development experience. Attentive to detail and methodical, with a passion for identifying opportunities for improvement and affecting change. Skilled in data analysis, creating automated and scalable data pipelines, as well as product planning and architecture. Leading the data product development of Maxpoint customer catalyst enrichment and activation solution. Took the product from ad-hoc, client specific development to fully enrich client CRM audiences with the proprietary and third-party location, interest, and purchase data, allowing them to combine online and offline information for a more holistic view of their customers. Designing and implementing the refactored data enrichment pipeline which reduced the total processing time from 2 days to under 24 hours and halved the required. Developing Maxpoint's probabilistic cross-device capabilities. Saved Maxpoint hundreds of thousands of dollars per year by finding weaknesses in the third party data we were using, and implementing an in-house solution. Designed a user similarity graph using locality-sensitive hashing model in Scala. Increased targetable audience sizes by up to 100% by linking users mobile and desktop devices across time. Providing technical insight for product teams to drive decision making. Objective : Junior Product Analyst with over 4 years of experience with the ability to work independently and manage business expectations with a delivery-focused approach to work. Ability to build and maintain strong working relationships with senior and junior business sponsors, as well as technical specialists In-depth knowledge of System Development Life Cycle (SDLC) methodologies like Agile, Rational Unified Process, Waterfall Extensive Agile and Scrum experience. Initiated the project from the planning phase using the agile methodology and facilitated meetings with business SMEs to write business user stories. Documented the initiatives and features based on the scope and discussion with the business SMEs. Documented business user stories with business rules using rally and reviewed business user stories with the business SMEs. Created documents to capture the business process and process flow required for documenting solution definition. Performed gap analysis to check the compatibility of the existing system and identified gaps that require a change in order to optimize the proposed system solutions. Created mockups for the various registration flow and also created a signoff document listing name, description and functionalities of each screen page for client sign-off. Facilitated technical analysis sessions with the impacted work streams to analyze scope and document API dependency. Collaborated with the solution architects from various work streams to help document the solution definition and created user stories. 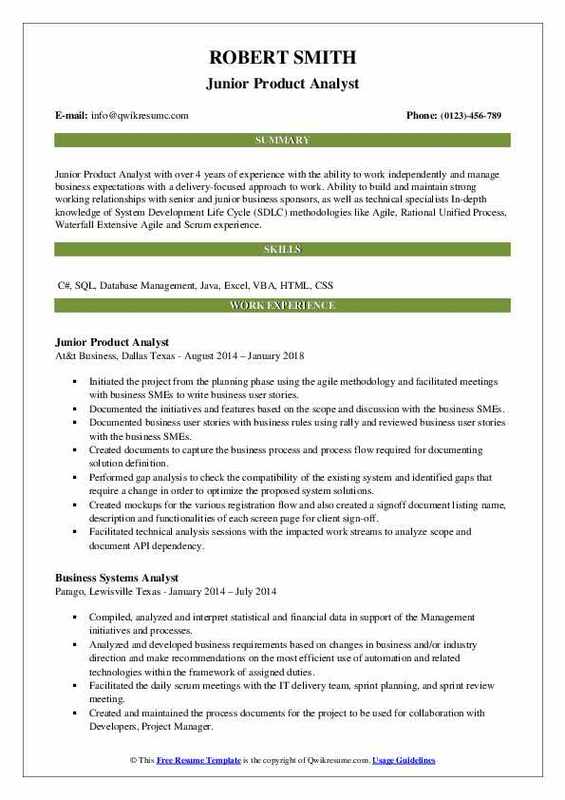 Headline : Product Analyst with over 5 years of Business Analyst experience with a solid understanding of business process analysis in a web-based and client-server environment. Strong domain knowledge in e-commerce, retail, finance, and mortgage banking with Agile (Scrum) and Waterfall methodologies. Extensive experience in gathering, analyzing, and validating business requirements. Conducted usability and user acceptance testing (UAT) on behalf of end users. Skills : Agile, C++, COBOL, HTML, .NET Data Bases: DB2, Microsoft Access, Oracle (SQL queries), SQL Server, Lotus Notes Reporting tools: Crystal Reports, Business Objects Hardware Environment: IBM Mainframes, AS400. Worked on multiple projects for registration and profile management workstream under ATT business solutions e-strategy transformation initiative targeted towards small and enterprise business customers. Registration as a product would enable customers to self-service and manage their accounts and services online. Worked closely with the product owner to understand the product vision and roadmap. Defined features and functionality within the roadmap, and ensure that the product being delivered meets the needs of the customer. Break down high-level features into epics and workable user stories to be consumed by agile teams in the iteration. Groomed user stories with the delivery team to make them ready for iteration and also get point sizes for better sprint planning. Attended the daily team stand-ups to communicate progress and identify impediments. Worked closely with scrum master to ensure timely completion of user stories. Summary : High-achieving Product and Business Analyst Professional experienced in process improvement and requirements gathering, quality assurance, and control, and business systems analysis. Ability to devise innovative solutions to resolve business and technology challenges. Results oriented, advanced problem-solving abilities. Team player, possesses excellent communication skills, organizational and analytical capabilities. Coordinated all aspects of product management including regulatory compliance, legal considerations, operations, communications, and marketing across the entire organization. Also managed business and system integration regarding health insurance mandates for commercial group contracts. Complied with federal, state, and corporate policies, procedures, and regulations. Facilitated information flow between sales, account management operations, marketing, communications, and document production departments to guarantee product objectives were met. Monitored product performance and recommended product design changes. Interfaced with cross-functional product teams on project assigned activities. Wrote, proofed and edited product profiles in line with product launches and government mandates. Provided support for the corporation’s vision insurance subsidiary. 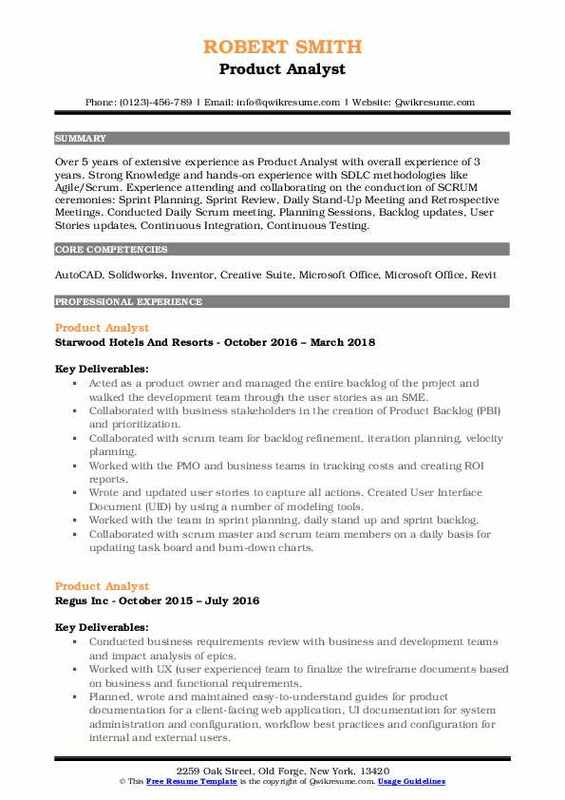 Summary : Senior Product Analyst with over 7 years of experience looking for an engaging company to further my analytical skills. Experience in working with off-shore development teams. Experience in writing functional specifications based on user requirements. Highly proficient in Microsoft Excel, Access, PowerPoint, Word, Outlook, Publisher, Essbase, Power Pivot, Adobe -Experienced with various software programs and languages, including SQL, SAS, Teradata, Business Objects. Creating and managing backlog of user stories in Pivotal Tracker/Jira for the Home Depot mobile application in the tracker and prioritize for each sprint according to business value. Ensuring product is aligned with the company, stakeholder, and end-user priorities to drive sales, improve efficiency and customer satisfaction. Identifying the pros, cons, issues, obstacles, dependencies, and value associated with features and enhancements. Discussing the product roadmap with the leadership team to ensure those are aligned with organizational goals. Ensuring the UX designs created in Zeplin are meeting the goal of the story. Partnering with UX and analytics teams to conduct external research and usability studies to understand how customers are interacting with the mobile application and develop enhancements based on the results/ analysis. Facilitating the user acceptance testing and responsible for defect tracking. Hands on experience in Adobe reports analytics for the data analysis. 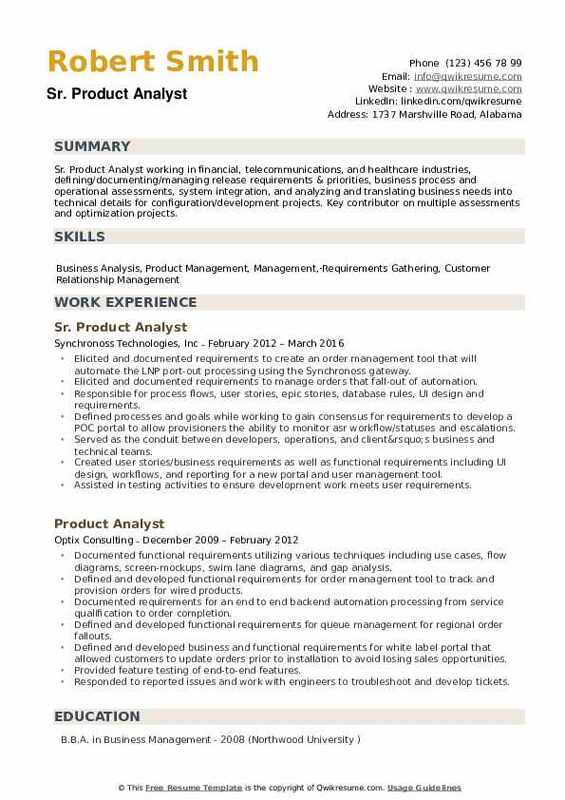 Objective : Goal oriented Product Analyst with over 4 years of experience. Possessing analytical skills, with an eye to improve processes for added efficiency. Dependable, organized, energetic, hard worker opened to learning new tools and skills. Experienced SQL Oracle, Tableau, Power BI, Microsoft Excel, Microsoft Word, Microsoft Outlook, Microsoft PowerPoint, Hyperion EPM, Visual Studio TFS, Agile, Project Management, Data Analytics, fluent in Spanish. Determined the projects operational objectives by studying business functions, gathering information, evaluating output requirements, and formats. Designed new computer programs by analyzing requirements, constructing workflow charts and diagrams, studying system capabilities and writing specifications. Provided references for users by writing and maintaining user documentation. Developed clear and concise application strategies with robust and comprehensive requirements collection and managed processes that fulfilled all requirements simultaneously. Worked with management on software quality issues affecting product development. Managed projects independently through all aspects of the product lifecycle, including business and product requirements, process workflow, functional specifications, technical design, use cases, test cases, training materials, and implemented the communication plans and deliverables. Facilitated and participated in planning and strategy sessions to create concise and directed communications on updates and new features as well as project standards and constraints. Wrote and distributed communications on these efforts in accordance with established standards of quality. 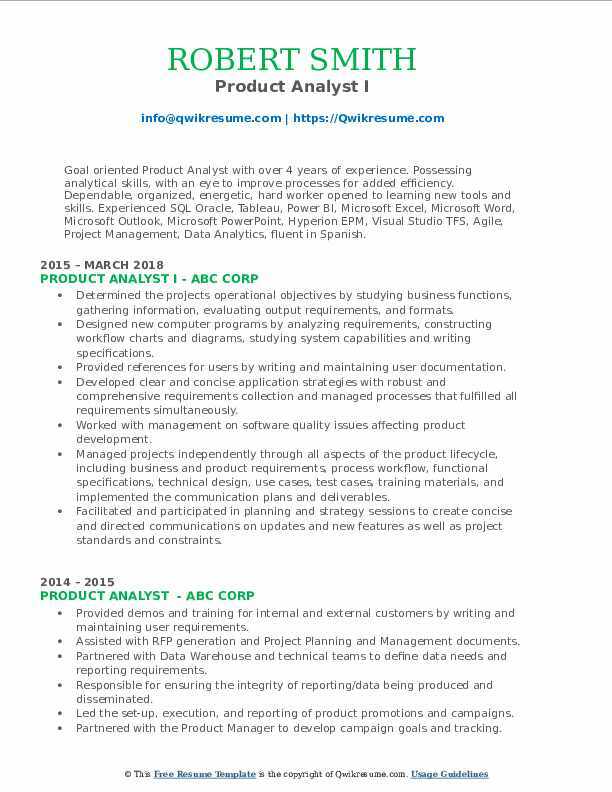 Objective : Over 5 years of extensive experience as Product Analyst with overall experience of 3 years. Strong Knowledge and hands-on experience with SDLC methodologies like Agile/Scrum. Experience attending and collaborating on the conduction of SCRUM ceremonies: Sprint Planning, Sprint Review, Daily Stand-Up Meeting and Retrospective Meetings. Conducted Daily Scrum meeting, Planning Sessions, Backlog updates, User Stories updates, Continuous Integration, Continuous Testing. Acted as a product owner and managed the entire backlog of the project and walked the development team through the user stories as an SME. Collaborated with business stakeholders in the creation of Product Backlog (PBI) and prioritization. Collaborated with scrum team for backlog refinement, iteration planning, velocity planning. Worked with the PMO and business teams in tracking costs and creating ROI reports. Wrote and updated user stories to capture all actions. Created User Interface Document (UID) by using a number of modeling tools. Worked with the team in sprint planning, daily stand up and sprint backlog. Collaborated with scrum master and scrum team members on a daily basis for updating task board and burn-down charts. Performed formal benchmarking with SME for further suggestion and improvement. Led the sprint planning sessions with the team to place the backlog of inappropriate sprints and implemented release planning. 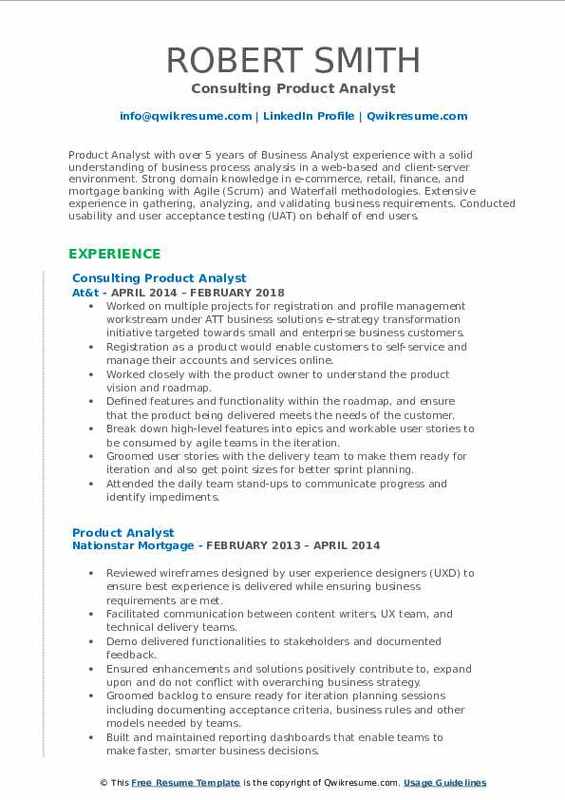 Summary : Experienced Product Analyst performing multiple duties. Good understanding of business relationships and business requirements. Experience with Software Development Life Cycle (SDLC) process. 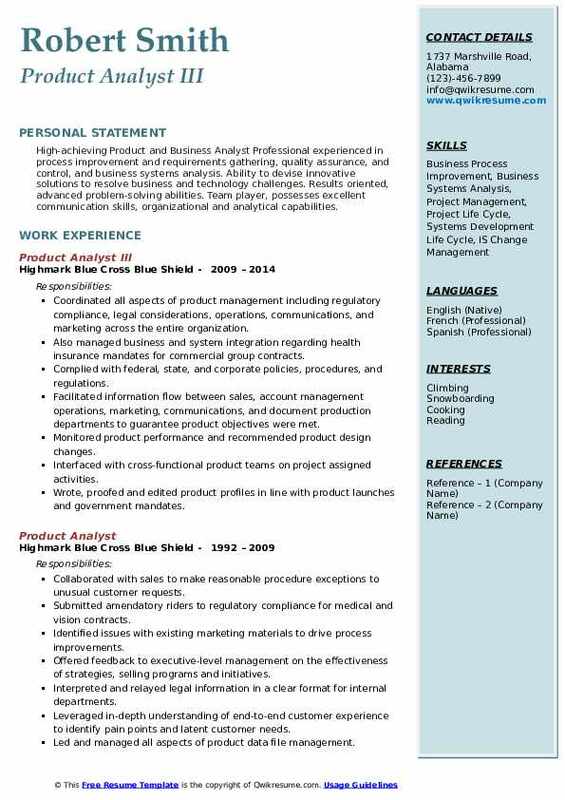 Experience as a Business Analyst working with well-reputed organizations. Extensive experience with Workflow process analysis. Hands on experience in creating Business Requirements Document (BRD). Experience in writing functional specifications based on user requirements. Gathered the requirements from the users analyze it and then transform the requirement into functional specification requirements for the team of designers and developer. Worked closely with business users to understand the business process and documented the same as stakeholder request. Validated the use case and corresponding screenshots with users in the use case review sessions. Assisted QA team in testing and made sure that the application being developed is in compliance with the success criteria defined in the user stories. Tracked and reported on teams progress and analyzed various project requirements. Responsible for creating end-to-end product lifecycle using Seibel application. Responsible for new products and promotions setup depending on users requirement. Handled all the weekly, monthly, analytical reports for all the products and promotions. Developed, validated and monitored all the products and promotion setups which are current. Validated all the products and promotions in three different platforms in Siebel until the product is live. Summary : Sr. 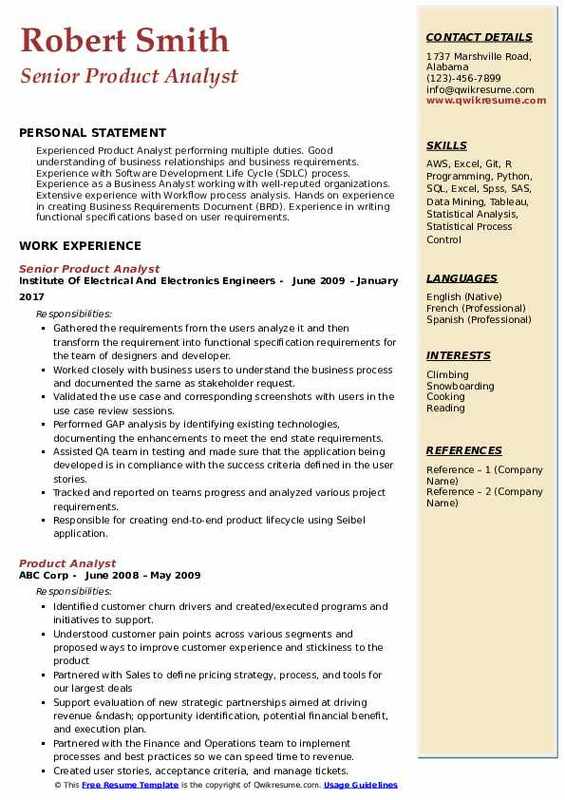 Product Analyst working in financial, telecommunications, and healthcare industries, defining/documenting/managing release requirements & priorities, business process and operational assessments, system integration, and analyzing and translating business needs into technical details for configuration/development projects. Key contributor on multiple assessments and optimization projects. Elicited and documented requirements to create an order management tool that will automate the LNP port-out processing using the Synchronoss gateway. Elicited and documented requirements to manage orders that fall-out of automation. Responsible for process flows, user stories, epic stories, database rules, UI design and requirements. Defined processes and goals while working to gain consensus for requirements to develop a POC portal to allow provisioners the ability to monitor asr workflow/statuses and escalations. Served as the conduit between developers, operations, and client’s business and technical teams. Created user stories/business requirements as well as functional requirements including UI design, workflows, and reporting for a new portal and user management tool. Assisted in testing activities to ensure development work meets user requirements. Maintained strong business relationships with business client and other departments and vendors to ensure successful system and application implementation and support.